Jeff Farano is back to claiming there is a “small group of vocal opponents” even though we gave petition numbers of 2800+ on-line and 800+ paper at the City Council Meeting. He also says opponents spread “misinformation” and created “fear and confusion”. Please don’t let SunCoast discredit/trivialize the concerns of residents. The city staff’s report supporting a recommendation to deny the project reflects many of the concerns of residents as well. Is Jeff Farano saying that they are spreading misinformation and creating fear and confusion as well with their detailed analysis and findings? I received a letter (dated June 18) from Jeff Farano, Suncoast, explaining what they are doing and urging me to support the DRSL Development Project. I was very disturbed by how he twisted the facts…to try and convince me/residents that the building of huge apartment complexes in Deer Ridge and Shadow Lakes is beneficial/an improvement. So I would appreciate it if you would read my response below before you make your decision on July 12 and in August. First, I’d like to say SunCoast did not try everything. In 2017, the SL golf course and club house had been poorly maintained for years. There were weeds everywhere and plants were extremely overgrown. The club houses at both golf courses had areas that needed repairs and painting. Things were falling apart. When SL announced rotations, we all knew for sure it was not doing well. I met with Charles Fralix, the General Manager at the time, to see how we, residents, could help. I suggested we could get volunteers to help but he said “no” because that was a liability. I asked about getting additional funding from the owner to make repairs so the course and facilities can be more attractive. He said the owner would not increase their budget. Second, we now know of an interested credible buyer. Advance Golf made an offer and was turned down. To this day, Jamie B. Miller of Advance Golf says their offer was credible. (See email below.) And in the meanwhile, the golf course continues to deteriorate. Now it will require a lot more money to rehabilitate. The fact is they did not meet with the community before the proposal was created. They did meet with the community to share their final proposal and tried to convince residents that was the “only” solution. They did meet with the community to ask their ideas for what to do with the closed golf holes. They would have saved a lot of time and money. Money they could have used to maintain/improve the Shadow Lakes golf course making it more attractive to golfers. I am not here to guess what residents want or what the best solution is. But I do know many do not want huge apartment complexes next to or near their homes. Go to https://goo.gl/VLmjw9 and you will see 2800+ have signed the online petition against the high density apartment complexes. Don’t be fooled by his “end result” proclamations. The “senior homes” are huge apartment building complexes with a total of 560 units. The proposed apartment complex of 18.2 acres just for Shadow Lakes will be the largest apartment complex, both in mass and acreage, in all of Brentwood, present and pending. The proposed apartment complex of 13.77 acres for Deer Ridge will be the third largest. These proposed apartment complexes are very undesirable and extremely out of character with the low to very low density houses of these communities. Many of us question if there are 560 seniors waiting to and can afford to rent out those apartments. 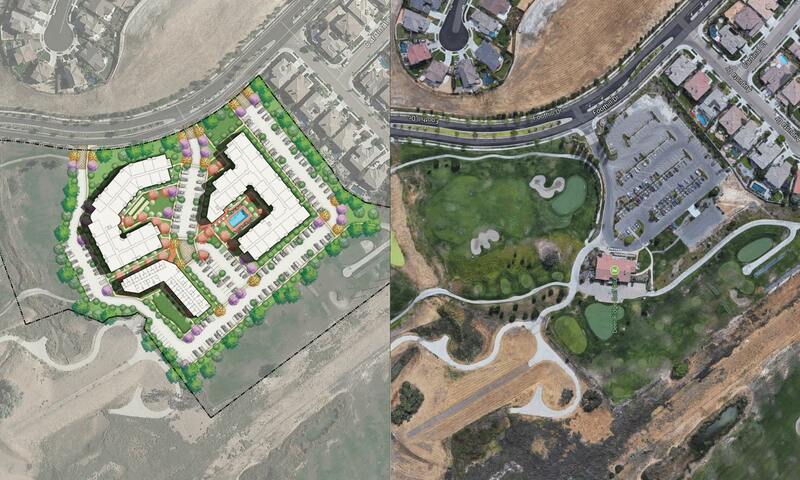 These apartments would be charging a premium to fund a golf course that many seniors may not use. What if these are not rented out? What will they do if they cannot get that ongoing funding? Change “senior” to “regular” apartments? Not maintain the combined golf course? This is a loss only for the SunCoast. This is an empty threat. If any housing developer wants to build houses on the golf courses/open spaces, s/he would have to go through a very challenging General Plan change and rezoning process. The same process Suncoast is going through now. Hopefully that developer would be smart enough to get input from residents before they come up with plans. This is not the whole truth. The present General Plan and Zoning are legally binding and yet anyone, like SunCoast, can come along and apply to change it. The developer agreement may no longer be valid if the General Plan and/or zoning are changed by other developers. And what consequence are there if the development agreement is not met? What if SunCoast/developers declare the project unprofitable and/or declare they lack funds? Even if there are written/agreed upon consequences, how would these be enforced? The city does not have the funds to be in lengthy litigation. First, we need to see that impact analysis so that these figures quoted are verified. Second, we do not know if the amount $105, 370 would be enough to cover all the cost of city services that 560 plus new residents would generate. We do not know how much of that $135,000 would actually go to local fire services and how much of that $600,000 would actually go to our schools. I urge Council and Commission members not to take their numbers at face value. To question them and get the facts if those numbers matter. But in the end, it doesn’t matter to me and many other residents because the huge apartment building complexes are not wanted in our community. They are not a desirable element in our community. After the proposal is rejected. I will be happy to be a part of a community group to discuss solutions and what is acceptable.